Event display of a simulated H->YY decay with the Higgs boson produced in proton-proton collisions at a center-of-mass energy of 13 TeV. The red lines correspond to the muons of the two Y->μ+μ- decays, while the green lines show other charged particles reconstructed with the inner trackers of CMS. The Standard Model of particle physics asserts that the Higgs boson generates the mass of all fundamental particles. In 2012 a new particle was discovered at the CERN LHC that behaves closely like the Higgs particle predicted by the Standard Model. Since then, the CMS and ATLAS experiments have tested the behaviour of the Higgs particle when interacting with several Standard Model particles, including into bottom and top quarks. So far all measurements are consistent with the predictions within the experimental uncertainties. The agreement of the measurements of the Higgs boson discovered in 2012 is an educative demonstration on how closely quantities predicted by the Standard Model over the past five decades agree with measurements. Nevertheless, it is widely acknowledged that the Standard Model is an incomplete theory that will not work at all energies. To begin, the Standard Model only describes visible matter, providing no explanation for the dark matter that is substantially more abundant in the universe. Furthermore, the Standard Model does not address the vast difference between the masses of particles, essentially rephrasing that question to why particles interact differently with the Higgs boson. And the mass of the Higgs boson itself is expected to receive large corrections, resulting in the need for “unnatural” cancellations between large numbers to achieve the measured value. These shortcomings are just some of the indications that extra particles with new forces between them might exist. One of the ways to test for solutions to these shortcomings is to search for deviations in the behaviour of the Higgs boson with respect to the predictions by the Standard Model. If new particles exist, they can change the possible ways the Higgs boson can decay. Even if the new particles have substantially higher masses than the Higgs boson, at which point a direct decay would be impossible, they can contribute indirectly, or virtually, to a particular decay, possibly increasing its frequency. By comparing the different decay modes to Standard Model predictions, a pattern might emerge that could be the first step to develop new theories beyond the Standard Model. Several years before the Higgs boson was discovered it was pointed out that its decays into pairs of J/ψ (pronounced Jay-Psi) and Upsilon particles, commonly called quarkonium pairs, can be substantially enhanced in many scenarios that predict physics beyond the Standard Model. The J/ψ and Y are bound states of a charm quark and antiquark, or a bottom quark and antiquark, respectively, and the Standard Model makes accurate predictions how often this should be happening. To observe such decays according to the theoretical predictions in the Standard Model would require the collection of at least 100 times more proton-proton collisions with the LHC than available today. However, there are also several ways new particles and forces can substantially increase those decay rates, and any observation of such decay would indicate that the Standard Model is wrong. Each J/ψ or Y has a chance to decay into pairs of oppositely charged muons, which makes them ideal candidates for the search with the CMS detector. The 3D event display shows a simulated H->YY event, where each of the Y-particles decays into a pair of muons. The four muons are shown as red lines and the muon detectors that detected the muons are shown as red rectangles. In the inner cylinder of the CMS detector, charged particle tracks from the rest of the event are shown as green lines. The requirement that all four muons traverse the detector, are reconstructed and identified is a stringent condition. Thanks to the large acceptance and high efficiency of the CMS detector, the data analysis finds about every fourth such event produced in proton-proton collisions. CMS collaborators used samples with only one J/ψ particle to study possible differences in the selection efficiency between data and simulation. They were found to be at the percent level, and corrections were applied to the simulated samples used in the analysis. The final state is extremely clean and events with two such J/ψ or Y particles are rare, as shown in the left part of the figure where the recorded data (black dots) agree with the background prediction (blue). One can conclude that already a single event that shows up at high masses could present a crack in the Standard Model – an exciting aspect. Figure: Four-muon invariant mass for events with Y pairs. The data distribution (points) decreases exponentially (blue line). 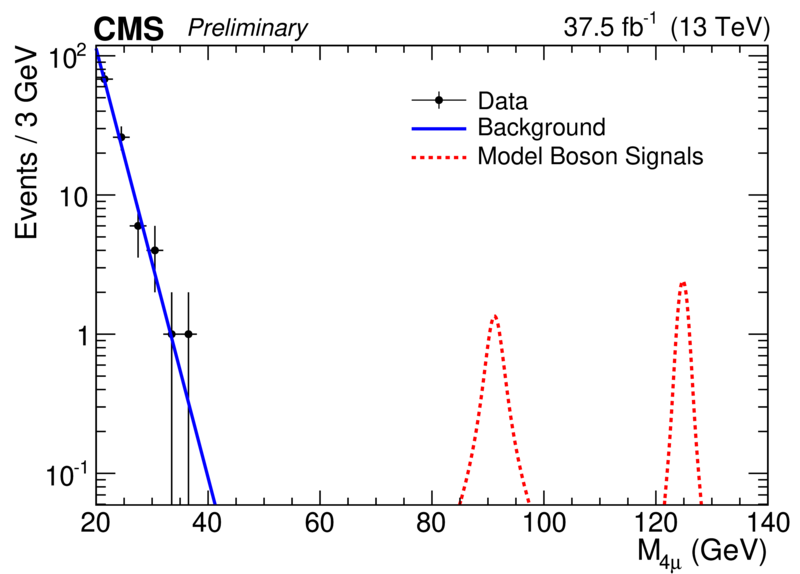 The red dashed lines correspond to the assumed signal distributions for the Z-boson (at 91 GeV) and Higgs boson (125 GeV). There is no event observed in the vicinity of these masses. The red dashed lines correspond to what data would look like if such pairs were originating either from the decay of a Z or a Higgs bosons. These signal regions were only investigated once the reconstruction and selection procedure, including the determination of systematic uncertainties, was completely established. After “unblinding”, no candidate event was observed at high masses, and stringent upper limits for the Higgs and Z boson decays to pairs J/ψ and Y were obtained. The limits are the first results on these rare decays and have been presented at the Moriond conference in March 2019. This analysis sets the starting point to push the limits lower over the next years with LHC and eventually with the high-luminosity LHC that starts in 2026, and it will be a very long time before enough data is available to reach the Standard Model prediction. In the coming years, even a single data event found consistent with the Higgs signature is bound to cause a lot of excitement.